I cannot remember the first time I kissed a girl. I can remember, however, the first time I really heard good sound. In the mid 1970's, my brother owned the first component stereo I had ever heard. I still remember what it was. He had a Marantz 2220 receiver, a Garrard turntable with a Shure cartridge, and a pair of Dynaco A25 Speakers. The receiver and speakers are considered classics today, and Garrard has a definite following, albeit for the Zero100, 301, and 401 models. I had never heard sound like that before, and I was hooked. I have owned countless receivers, integrated amps and separates in my 20 plus years of owning a component system. I also worked in the industry as a salesman and store manager for a small Orlando based AV chain. No matter what gear I owned or sold (and, as you can imagine, I have had some nice gear) I couldn't recreate the magic and excitement of the first time I heard a decent component system. One of my standout systems that I purchased used in the mid 80's before I "upgraded" yet again was a Marantz 2270 receiver, a Dual 1229Q turntable with a low end Grado cartridge, and a pair of Large Advents. That combination made music far better than it had any right to. It imaged and threw a soundstage like nobody's business. No power conditioning, no fancy speaker cables or interconnects. No siree Bob, just plain Jane interconnects and some zip cord. Plug it in the wall, and let 'er rip. I actually measured the distance of the speakers from the back wall using a dollar bill. A dollar bill, in case you didn't know, is 6" long. It was a small room, and I was a poor bachelor. Overall, I've had far better systems technically, but they have (mostly) lacked emotionally. I came to the conclusion that I have spending too much time over the past few years chasing musical "truth" and not the music itself. What is musical "truth" anyway? Very few people really know. I wasn't there to listen to the Beatles record the White Album at Abbey Road. Nor was I there (I wasn't born, actually) when Antal Dorati conducted the Minneapolis Symphony Orchestra performing the 1812 Overture for Mercury in 1960. What I was lacking was true enjoyment and emotional connection with the music. Think about photographs for a minute. I didn't want a soft, sepia toned picture, although they are rather enjoyable in a retro sort of way. On the other hand, I didn't want a razor sharp close up where I cold see the individual pores in a subject's face. I wanted, sonically, something in the middle, not washed out and glossed over shadows of a performance, but not distractingly detailed either. I wanted resolution without distractions. At the same time, I wanted something exciting, where I couldn't wait to turn the system on and revel in some new music, or get a fresh perspective on music that I know well. In short, a tall order indeed. When I was a kid, I was asked to help some people from our church help clean out an elderly lady's attic. While I was working, I came across a stack of old Stereo Review magazines (Some were actually called Hi Fi and Stereo Review, the magazine's original name.) I was given the magazines (they were going to be thrown out anyway.) I spent hours at home devouring not only the reviews, but the ads as well. One that I have never forgotten was an ad for the then brand new Phase Linear 700 power amp, which put out a whopping 350 watts per channel. The ad copy, supposedly written by Bob Carver, its designer and company President, explained why everyone needed that much power. No, it wasn't to really piss off your neighbors with incredibly high SPL's, although it could do that. It's all about headroom, or the ability to cleanly reproduce musical transients. As an example, Dr. Carver cited reproducing the sound of a pair of scissors cutting a piece of paper at the same volume it would be in real life. As expected, the overall amount of power required was miniscule, however it required hundreds of watts to cleanly reproduce the peaks that the recording had. And that was with scissors and paper. Can you imagine music? It made sense to me, and I obviously never forgot it. Never mind the fact that the 700 sounded dreadful, and it was quite unreliable. Phase Linear didn't get nickname "Flame Linear" for nothing. All things being equal (and they seldom are) I prefer high power amps. I like having the ability to play loudly if I choose to, but like the ad said, it's all about headroom. Just as one wouldn't buy a car that only does 70mph, even though that's as fast as one can drive legally in most states, I want more amplifier power than I really need. I want my amps to loaf along, not even breaking a sweat. Remember, also, that clipping (overdriving the amp) kills speakers, not "too much" clean power. Keep in mind that the differences in power can be deceiving. A two hundred watt amp does not play "twice as loud" (whatever that is) than a one hundred watt amp. It will play 3dB louder, which is noticeable. To get "twice as loud", one must go to 1000 watts. Again, it's not how loudly can it go, its how much power is in reserve for musical peaks. Most people actually listen, most of the time, at one watt (continuous) or less. I have found that well designed tube amps tend to give more usable headroom than solid-state designs. The rough rule of thumb is that a two hundred watt tube amp is comparable to a four hundred watt solid-state design. Some believe that tubes do put out more power than comparable solid-state designs. I think the differences are in the distortion that is generated by the two different types of amps. Solid-state amps tend to clip abruptly, producing odd order harmonics, which is easily identifiable as harshness. Tube designs, on the other hand, clip gently, generating mostly even order harmonics, which are much less noticeable and objectionable. Additionally, I believe having a high-powered amp allows for flexibility when choosing speakers. A good high-powered amp is likely to be able to drive any speaker I would own. No, you aren't going to mate a big amp to horns or Lowthers, although I guess you could. But I'm not likely to own either. I have yet to hear a horn that I like enough to buy, and I haven't heard a Lowther type speaker that I like at all. If you think about it, a Bose 901 driver isn't that dissimilar to a Lowther. I wouldn't own a pair of those either, although there are many Lowther lovers that are also Bose bashers. I find it curious. At least I'm consistent. I think the McIntosh MC-162 ($2200) is a great power amp, but delivering approximately 130 watts per channel into my Infinity Kappa 6.1 speakers' 6-ohm load, I found it a bit short on power. I thought of buying a second matching amp, and bridging each into a monoblock (350 watts per channel), but I was concerned that bridging would change the sonic character of the amps. I also considered trading the MC-162 for a MC-300 (300 watts per channel, $3500.) I pondered and listened for months, and decided that the McIntosh house sound was nearly (but not quite) as transparent as I would ultimately like. I had known for some time that my Audio Research SP-9 was bound for resale. There is a lot of Chinese tube gear currently flooding the U.S. market, at both ends of the price spectrum. Some of the gear is very good, some of it is lacking. A major difference between JoLida and many of the other brands that market Chinese manufactured gear is that JoLida owns their own 20,000 square foot factory in China. All of the gear is built there, with final assembly in the U.S. In the case of the Music Envoy gear under review, some of the digital protection circuitry and installation of some heavy duty resistors is completed in the U.S. at JoLida's Maryland facilities. Additionally, all tube testing is done here in the States, as well as a comprehensive testing and burn in procedure before packing the components for shipment. JoLida does not source their gear from any other manufacturers. They are in 100% control of all of their gear, from the design stage to production. As a contrasting example, the Music Hall CD25 CD player is actually manufactured by Shanling in China and their turntables are manufactured by Pro-Ject in the Czech Republic. I have no axe to grind with Music Hall, and realize they are in a completely different price range than the gear under review. I'm just making a point, and Music Hall came to mind. Would I prefer that the gear be made 100% Stateside? Sure I would. If that were to happen, however, the gear could not be so reasonably priced, as Americans will not work for Chinese wages. JoLida's gear is priced a bit more than their Chinese competition, as the factory workers are paid three times customary wages and enjoy benefits (such as free lunch), as opposed to the slave wages (and treatment) normally associated with China. More importantly, I think, is that the workers are encouraged to think for themselves - if one discovers a more efficient way of doing their job, for example, they are encouraged to share with management. JoLida benefits by enjoying excellent employee retention. Music Lovers benefit by having a higher build quality than that usually associated with China, by long term, trained and skilled factory workers. The gear may cost a bit more, but I can live with that. Speaking of testing, all of the JoLida monoblocks (there is a less expensive, electrically similar, but cosmetically different model, the JD3000, priced at $5200/pair) are run at 150 watts output for 5 days. Additionally, a computer generated "Electric Shock Test" is run on all of the amps. In this test, all frequencies from 5Hz to 100kHz are fed the amp for a very short period to ensure amplifier stability, as well as putting a heavy load on the capacitors to ensure reliability. In the design stage for two years, the Music Envoy amp and preamp represent the top end of JoLida's model offerings. A conversation with Michael Allen, President of JoLida, shed some light on the design goals of both pieces, and some interesting information on the capabilities of the trio. Two criteria were paramount to the design process: reliability and sound quality. Upon unpacking the units, I noticed two things right away. First, the build quality at least equal to any of the "big" salon brands, at any price. The second thing I noticed was the craftsmanship evident in the construction of the monoblocks. The Music Envoy monoblock amplifiers, rated at 200 watts per channel, exude quality over every square inch of their chassis. 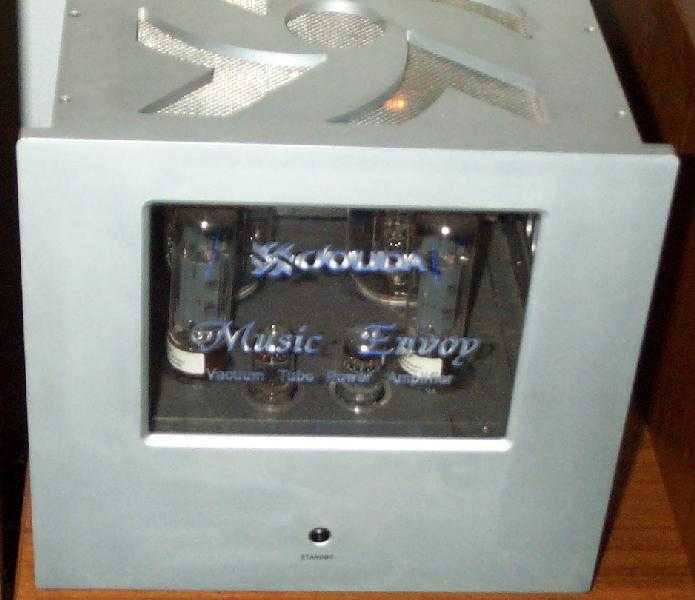 The front of the amps have a large, thick glass window so the user can see the tubes in operation. The glass is engraved with the JoLida logo and "Music Envoy Vacuum Tube Amplifier." When powered up, the window lights blue, and the engraving catches the light, which shows off the quality of the engraving work. Below the window is the standby switch. Behind the glass panel are the vacuum tubes, a pair of 12AT7 input tubes, a pair of EL34 driver tubes, and a pair of 211 output tubes. The top front of the amps have a thick metal tube cover, internally covered with mesh. The ventilation area of the tube covers is cut into the shape of JoLida's logo. Behind the tubes is a mirror, to give the illusion that there are more tubes inside the amp than there really are. Behind the mirror, the chassis is solid metal, covering the power and output transformers. The lower section of the rear panel has the usual inputs and outputs. A couple of things are different here. As the trio is remote controlled, there is a 12 Volt trigger for the included umbilical cord that connects between the preamp and the power amps, so that the power amps will turn on with the preamp. A nice touch here, although all three components will power immediately with the remote, the preamp comes out of standby mode after approximately 5 seconds, the power amps require approximately 45 seconds for the circuits to stabilize and be fully operational. This way should there be a turn on thump with the preamp (there are none) the signal will never make its way to the speaker. I did find the speaker binding posts to be a bit disappointing, especially for an amp in this price range. Manufactured by WBT, they are of high quality, and make a secure connection. Here's the rub- the connectors are designed for bare wire, pins, or banana plugs only. Spades will not work with the Music Envoy amps, so one must either re-terminate their cables, or purchase a new set. The amps have both 4 and 8 ohm taps. I connected my 6-ohm speakers to the 4-ohm tap. A fused IEC power connector, a master power switch, and an unbalanced RCA input jack occupy the rest of the rear panel. Balanced connectors were not implemented for two reasons: first, according to Michael Allen, most audio gear that includes balanced connectors tap off of the same location internally as the RCA connections. Additionally, the real benefit of true balanced connections used in professional applications like sound reinforcement at a rock concert, for example, really comes into play when cables longer than 50 feet are used. One real world advantage to balanced connections is that one doesn't get that nasty hum if cables are connected or disconnected while the system is powered up. The ground pin connects first and disconnects last, the opposite of RCA cables. There is an easy way around this- change cables with the system off. The real engineering takes place inside the amp, but lets start with the tubes. The 211 is an industrial tube, originally used by American military during World War II as a transmitting tube. Currently, it is used as an industrial heating tube, to seal plastic bags in a factory environment, for example. It was selected for its durability, sound quality and low cost. Being an industrial tube, the 211 can be expected to last for 20,000 hours. When replacement time comes, I've seen Chinese Sino 211's online for $45, or $180 to re-tube both amps. The Music Envoy trio has proven to be very easy to live with. The 211 is an easy tube to find, but not available in the vast array of brand names of the more common tubes like a 6550, KT88 or EL34. I didn't do any tube rolling with the amps or preamp, but did see World War II vintage 211s on both Ebay and an online tube seller for approximately $600 for a quad. The Chinese 211s are quiet and reliable, so I wouldn't recommend spending $600 for output tubes that may or may not offer performance advantages. Actually, these were the first components from JoLida where I didn't feel compelled to change tubes. I did experience a tube failure with the Russian Electro Harmonix EL34s supplied with the amp. Nothing catastrophic here, the amp went into standby. That's it, not even a blown fuse. I replaced all 4 tubes with a quad of Svetlanas that I already had, and re-biased the amps. The 12AT7's should last for years. The 12AT7s and the 211s are made in China. Each bank of tubes has its own power supply so that there are not any excess demands placed upon any of the circuitry. Think, for a moment of most high power tube amps. They usually employ lots of tubes, and many times, these tubes and the related circuitry draw current from one power supply. The Music Envoys have only 6 tubes per side for added reliability and economy at tube replacement time. 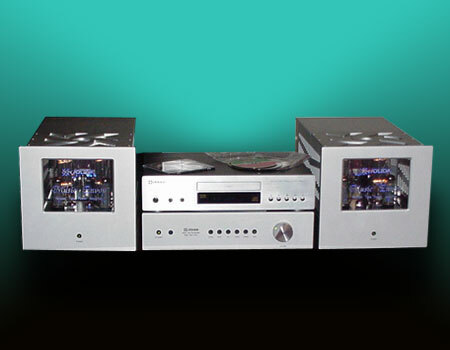 Both the preamp and the monoblocks are covered by a 2 year parts and labor warranty, 1 year on the tubes. The amp is designed for ultimate reliability in "real world" situations. I was told that during testing, an amp was plugged into a 240V line. The only thing that happened was a blown line fuse. A pair of monoblocks was left on at the factory for a year with no voltage surge protection or line conditioning, and did not fail, regardless of wall outlet fluctuations. I had first hand experience with this in my listening room. A thunderstorm rolled through Central Florida where I live, and a voltage spike or lightning strike must have nailed me. I lost a garage door opener and 2 of my cordless phones, but the Music Envoy trio took the hit in stride. Except for 2 tube failures with EL-34s (more on this in a bit) the trio has proven to be totally reliable. The 22 pound remote controlled Music Envoy preamp utilizes the same chassis as the top JoLida hybrid integrated amp to save on production costs. The preamp uses a pair each of 12AT7 and 12AX7 tubes, again from China. The front panel, like monoblocks, is finished in attractive oxidized and sandblasted aluminum, which appears as whitish silver. It has 5 high level inputs, one of which is a tape loop. Also included is a full function phono stage, with variable gain, capacitance, and cartridge loading. The phono stage can be disabled for those who do not require it, adding a 6th high level input instead. Inside, the preamp has 3 separate power supplies, one for each gain stage, as well as a smaller power supply for the built in phono stage. The phono stage is fully shielded and mounted inside its own metal sub chassis. The tubes are shielded as well to reduce the possibility of both RF interference as well as vibration. High quality Wima caps are everywhere. The workmanship inside is extremely high. Around back are the input jacks, a pair of output jacks, two pairs of tape outputs, and a plate that covers the DIP switches that control and activate the phono section. A nice touch here: a diagram is engraved on the plate to show users what positions the DIP switches need to be in for the particular cartridge used. I used only the lowest gain setting and had more than enough gain for my Dynavector high output moving coil cartridge. Also present is the connector for the Y cord to control the power amps by remote. The remote control is a smaller version of the hefty remote supplied with the JoLida JD-100A CD player. The remote controls the motorized ALPS volume pot and muting, as well as power and source selection. I am not a big remote user, but I did find myself using the preamp remote if only to conveniently supply power to the monoblocks. The output jacks have different output levels. Output pair 1 is for the monoblocks, offering 20dB of gain for power amps, output pair 2 offers 10dB for powered subwoofers or amps with extremely high input sensitivity. I did discover that the tape loop utilizes an unbuffered circuit. Basically, this means that if a tape deck or CD recorder is connected to the preamp but not powered, the user may experience distortion regardless of the input being used. The problem here is that recording devices place a very difficult load on the preamp. My Audio Research SP-9 has unbuffered tape loops as well. There are a few ways to alleviate the problem. The recorder can be powered at all times, or the signal cables can be disconnected. I did the second. Alternatively, Audio by Van Alstine does manufacture a black box that will buffer the tape loop, but this box isn't cheap at $499. My Marantz CD recorder may be an especially difficult load, I'm not sure. Your mileage may vary. Of course, for those who don't have a recorder connected to the preamp, this won't be an issue. The reason some manufacturers favor an unbuffered tape loop is for increased performance through the implementation of a simpler circuit. Setup of the JoLida Music Envoy trio is straightforward, but a bit time consuming. After removing the amps and preamp from their custom foam inner packing, it took me approximately 2.5 hours to get the set operational. For me that's definitely a record. The first thing that makes setup involved is the bulkiness of the monoblocks. They weigh 50 pounds each, and are deeper than they are tall or wide. The second thing is that I had no owner's manuals for the units. The review samples were the fourth set manufactured, and the manuals were not ready. 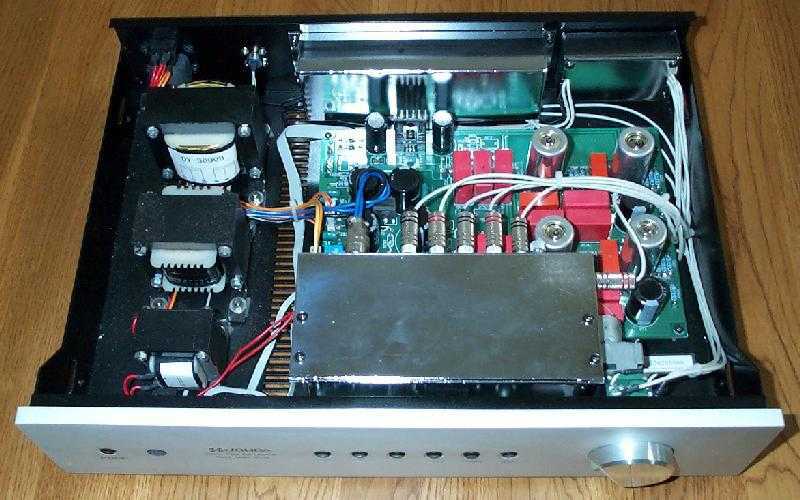 The power amps require that you remove the brushed aluminum tube access panel from the top of the amps, install the tubes, replace the panel, and bias the amps to 250 mV. Overall, this is pretty straightforward, but it took me a few minutes to figure out the proper way to insert the large 211s into their respective sockets. One must line up the key on the tube to the cutout in the amp, press down gently, and turn the tube approximately ¼ turn until it locks into place. While it took me a few minutes to decipher, it is a much better connection than the usual method of installing tubes. Biasing the amps is a bit of a pain, especially considering the price of the amps. To bias the amps, each one must be placed on its side (the bias pots are accessed from the bottom of the chassis), powered up, and each of the 211's (4 for a stereo pair) adjusted to 250 mV with a digital multimeter. This, excepting size and weight, is no more difficult than the other JoLida amps that I have reviewed (or the JD-502 that I bought) but the pots are a bit farther up inside the chassis than I am accustomed. Ultimately, I found it easier to remove the bottom panel and be very careful while biasing the tubes. Warning: this can be deadly; I do not recommend that you do this. Other high-end tube manufacturers feature easier methods of biasing the tubes. Conrad Johnson has red and green lights. Rogue has a meter onboard; ditto the large Audio Research amps. I would have liked to see, at the very least, the adjustment pots moved to the rear panel. As far as the pots themselves, I would like to see knobs as opposed to slots, which require a jeweler's type screwdriver for adjustments. Each 211 has its own adjustment pot, so there is no need to buy matched pairs or quads when tube replacement is necessary. The preamp had no issues during setup or operation other than the unbuffered tape loop. The preamp is plug and play straight from the box, no tube installation required. As I unpacked the units, I tried each one separately with my Audio Research SP-9 preamp and McIntosh MC-162 power amp. Even cold out of the box, the Music Envoy preamp smoked the Audio Research SP-9 hands down. Gone was the top end glare, and added was a sense of ease. The music just flowed better. While replacing my McIntosh MC-162 with the monoblocks added, most noticeably, a lot more bottom end. (The Music Envoy monoblocks are rated at 1dB down at 14Hz.) I am talking the type of bass output and control normally associated with big solid-state designs. The adjectives I would use to describe the trio are big, effortless, balanced, transparent, musical, but most of all (and most importantly) fun. The monoblocks do require some break in, approximately 100 to 150 hours to sound their best. As the break in period progresses, the bass output is scaled down in proportion, and becomes well integrated with the rest of the frequency spectrum. Simultaneously, the amps "open up" and transparency increases. Whether it be Beatles, Mozart (which I am listening to now) Cheap Trick, The Clash, or Frank Zappa, the Music Envoy trio conveys not only the music, but somehow transcends that and conveys the feelings and emotion that the musicians are communicating to the listener. I've had a blast listening to old favorites and enjoying music the way I want it to sound, real and immediate, involving and human. Not a "stereo", but real, breathing, exciting music. Tonally, the bottom end has heft, grunt and power of the type usually associated with powered subwoofers. No, the amps cannot break the laws of physics and make speakers exceed their capabilities, but my speakers seemed to have more bass output. The truth is that the change in amplifiers did it, and the monoblocks do have a deeper, flatter response at sub harmonic levels. This, in turn seemed to wring out the full capabilities from my Infinitys' 8" woofers. That's not the whole story here. That power was matched by speed and finesse, not sloppy, loose and uncontrolled bass that tube detractors will often associate with tube gear. The midrange was detailed without being strident. Not syrupy at all, it was natural, and again made me realize that I wasn't just listening to say, a saxophone, but a musician playing a saxophone. In my experience, only the very finest of components can convey this sense of humanity. The upper frequencies are smooth and extended. There just isn't much more to say here. The overall tonal balance and transparency of the Music Envoy preamp and monoblocks seemed to step aside and let the music flow naturally and gracefully. The fact that the monoblocks can deliver large amounts of power made the music flow effortlessly. Music had a big, bold quality, when appropriate, that approached live sound, but was just as believable playing chamber music. Speaking of transparency, I listened briefly to some classical music (WMFE 90.7) via my McIntosh FM tuner and was surprised that while listening to a signal that isn't compressed to death (like most pop stations) FM can actually sound good. It can have depth, width, image height- the whole thing. I've never heard FM sound so good. On the other hand, the trio is neutral enough to easily show the audible shortcomings of XM Satellite Radio, although they are great for variety and programming. I was surprised to see that the preamp included a phono stage. Considering the fact that this is the first JoLida component to include a phono stage, I didn't expect much, especially taking into account the low price of the preamp. The first indication I could be mistaken was the flexibility of the phono stage. At the lowest gain setting, I had more than enough gain for my high output Dynavector DV-20XH (2.5 mV) cartridge. I didn't have a medium or low output cartridge on hand, the phono stage was so quiet, I have no doubt that it would work well with lower output cartridges. My musical tastes are all over the place. I'll let you in on a little secret: I like German Beer Drinking Music, two albums at least. In the early 60's, Capitol released "German Beer Drinking Music" (DT10008) and "More German Beer Drinking Music." (T10297) These are fairly common and pretty easy to find on the used market. I far prefer the later release, not only because I prefer the music, but also because my copy is in stereo. The earlier release is in "Capitol Duophonic." (Read nasty fake stereo.) I've been unsuccessful in finding a mono copy. How far gone am I on these recordings? I own 2 mint copies of "More", the first an original pressing on the Capitol rainbow label, the second pressing is a mid to late 1970's reissue on the orange label Capitol International Series (ST10297). Late one night, I compared both pressings of "More" using my Creek OBH-11 headphone amp and Sony MDRV-6 'phones. Through the Music Envoy preamp it was easy to hear the differences between the two pressings. The earlier pressing was quieter, a bit warmer, and had better dynamics. What I noticed most was that my low cost headphone system doesn't sound bad at all when connected to the Music Envoy preamp. It's no Headroom Max with Sennheiser HD600s, but it is truly enjoyable, probably for the first time I've owned it. I've been told that JoLida is introducing a stand-alone phono stage based upon the phono stage in the Music Envoy preamp. At roughly $450, assuming it sounds like what I've heard here, I smell a giant killer. I tried the combo with a variety of interconnects and speaker cables. I found that the combination did exhibit performance differences depending on the cables used on the input side. Between the preamp and the amps, I found the differences between cables minor. Speaker cables did make a difference as well, but the cables used between the sources and the preamp seemed to make the biggest difference. Power cords made a minor difference. This does bring up another thought on true high-end equipment: differences. At this level, I don't think "better" or "worse" are applicable adjectives. It really comes down to differences. This equipment sounds different from that equipment. At this level, all of the gear is good. It really comes down to personal taste. Speaking of personal taste, I do own (and use) a modified and upgraded Audio Experience Concerto phono stage. It sounds quite different from the phono stage in the Music Envoy preamp. While it is a bit more refined in the mids, it certainly lags behind the Music Envoy phono stage in dynamics and bass response. The Music Envoy stage is more flexible and quieter as well. I'd say both are nearly equal in transparency, maybe with a very slight nod to the modified all tube Audio Experience. But then, maybe I nod that way because I know the Concerto is tubed, and the phono stage in the Music Envoy preamp is IC based. Personal biases do find their way into any review no matter how open-minded a reviewer claims to be. It's called being human. I do know that I would not recommend buying an outboard phono stage to mate to the preamp, as the built in stage is an excellent performer. Sometimes, I prefer the built in stage, sometimes, I prefer the outboard unit. I did carefully monitor my electric bill, and expected it to be elevated considering the high-powered amps. I detected no major differences in power consumption between the Music Envoy gear and any other amplifiers I've had in my system. In other words, don't worry. Be happy. I was listening to a CD one afternoon when I noticed that the midrange in the right channel was horribly distorted. Uh oh, I thought, I've blown the midrange driver. Not a disaster, overall, as I had a pair of brand new Infinity midrange drivers in the closet, and the speakers are roughly 12 years old. Stuff happens. Out with the old, in with the new, and the same problem was there. Hmm, I thought, maybe a bad tube in the CD player. Nope. I surmised a bad tube somewhere, but where? As a stab in the dark, I decided to check the bias on the amps again. On the affected channel, I measured 260 mV (an insignificant drift which could be caused by fluctuating voltages from the power company) on one tube, zero on the other. What the hell? The 211's were lit up like a proverbial Christmas tree. Upon closer examination, I discovered one of the Svetlana EL34s was dark. To determine if the problem was the amp or the tube, I popped the top on the amp and swapped the position of the tubes. Now both lit up. I biased the amps again (the left channel had drifted slightly as well) and all has been hunky dory since. How the amp worked at all with a dead driver tube, I cannot fathom. It does, in my opinion, show excellent engineering. JoLida has certainly met their design objective as far as reliability goes. These amps seem like big Energizer bunnies, they just keep going and going and going, even when they shouldn't. I've mentioned the fact that the monoblocks will not allow use of speaker cables terminated in spade connectors. I've also mentioned that I would have liked to see a more convenient method for adjusting the bias. The other thing is that the buttons on the preamp and the monoblocks are made of black plastic, with indicator lights in the center of the buttons. I would have liked to see silver buttons similar those used on JoLida's JD-100A CD player. It looks much classier, and these, after all, are top of the line units. When the units are operational, they light in soft green. I would have preferred blue power lights, matching the JD-100A, as well as the blue lights in the tube window. The sandblasted finish is slightly rough to the touch. Some cleaning cloths do not work well with this type of finish. I have found that dusting with a woman's soft blush applicator brush works well. Alternatively, "Grab It" type antistatic cloths work well too. Overall, these are small complaints. A bit more attention to detail could have made the trio absolutely perfect. Sonically, I am as impressed with the units as much as I am with their engineering and reliability. Run, do not walk, to your nearest JoLida dealer to audition the Music Envoy preamp before someone wakes up and raises the price $500, $600 or even $1000 more than it's current cost. It is one of the best values in high-end audio today. At $1500, it's nearly a gift. While 8 grand is hardly chump change, considering the build quality, over engineering for reliability, and sound quality, the Music Envoy monoblocks are a great value. For those who can afford them, they are a great choice, especially taking into account that they might just get you off of the upgrade conveyor belt, and lost in the music. If you haven't already guessed, I bought the review samples. Sayonara McIntosh and Audio Research. As I write this, both Hurricanes Charley and Frances recently crashed their way across Florida. Many people lost their lives, countless more lost their homes or places of employment. Our home sustained winds of nearly 100 mph with Charley. Frances pounded our home for over 36 hours. We were very fortunate; we only suffered some damage to our privacy fence around our back yard and some downed tree limbs. At the same time, while waiting for the storms to arrive and then leave, I found myself making mental notes of personal possessions that would need to be replaced in the event of a catastrophic loss. I've lived with long term, and enjoyed immensely, the Music Envoy trio. If I had not been so blessed, I would have bought them again without hesitation. They are that good. I would like to thank both Michael Allen of JoLida for supplying the review samples, as well as Bill Baker of Response Audio for supplying the Clarity Labs speaker cables used for the review.